ICYMI, Sandra Oh just made history as the first Asian-American actress to win a Golden Globe award for Outstanding Lead Actress in a TV series for her role in Killing Eve. During her emotional acceptance speech, the actress told her parents in Korean (the way she said "Eomma, Appa" is so adorable) that she loves them and bowed to them respectfully from the stage. Her dad bowed back and gave her a standing ovation! Sandra's father Oh Junsu is a businessman and her mother Jeon Young-nam is a biochemist. They immigrated to Canada from Korea as a young couple and raised their three children in Ontario. 1. 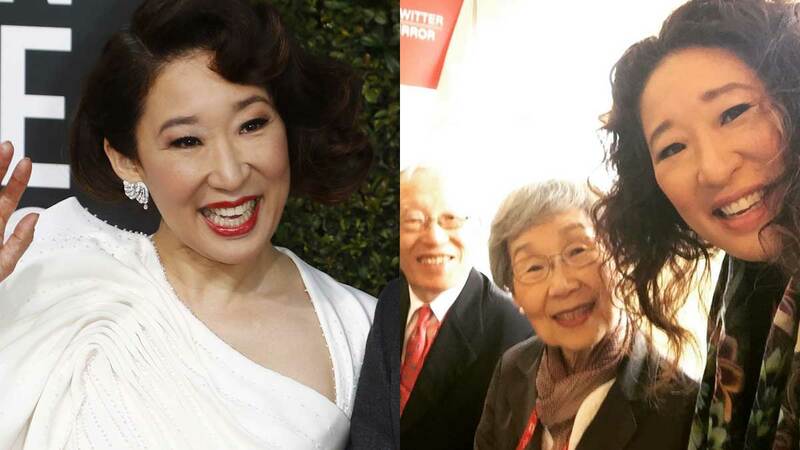 When she brought her parents to the Emmys in 2018 and her mom wore a hanbok! 3. When they took a family pic and her parents weren't looking at the camera. Sooo precious. 4. When Sandra posted this photo of them in front of her show's poster. 5. When the trio took a selfie on Canada Day!